In the dining room of this Livingston home, a circle motif is repeated in the subtle wallpaper pattern, credenza, mirror and lighting. “It’s a nice juxtaposition against the hard lines of the [African walnut] table and other case goods,” designer Jodie O’Connor says. Silk cream-and-blue-striped panels with triple-tassel trim suit the space without detracting from expansive views, the designer says. 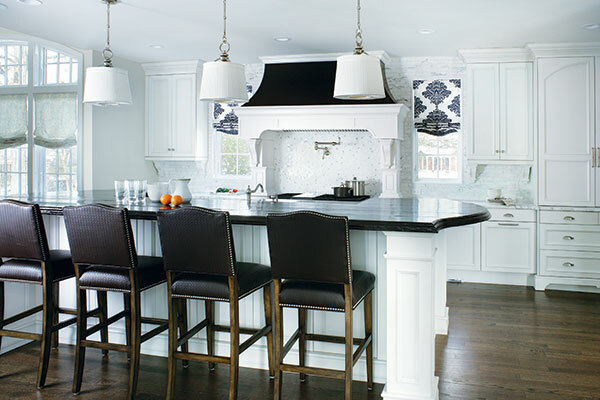 The kitchen is clean and classic with timeless white cabinetry, Arabescata marble countertops, high-contrast finishes and one exclamation of color: navy and cream Roman shades in a modernized damask print. Stools at the island are upholstered in easy-to-wipe-clean faux woven leather. This second floor loft/gathering room serves as a quiet haven away from the activity in the rest of the home. Sliding barn-like doors can be closed for privacy or to cut down on noise from the main rooms below. For fun, the design team carved a 13-by-13-foot secret room (not shown) off this space, complete with a pivoting bookcase. A chenille sectional, faux leather-top ottoman and plush leather club chairs put everyone at ease in the family room. Pale bluish-green accents enliven the neutral scheme. In the master bathroom, transitional cabinets in a dark espresso stain and polished chrome hardware pair up with a textural variety of Carrera marble tile. In the master bathroom, transitional cabinets in a dark espresso stain and polished chrome hardware pair up with a textural variety of Carrera marble tile. The shower combines white Thassos and Carrera marble in a focal-point herringbone pattern. 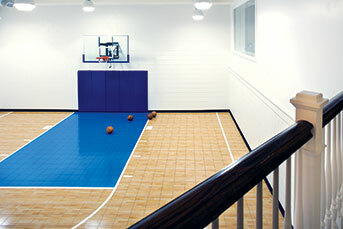 Excavating beneath the house to correct foundation issues led to a higher basement ceiling, the ideal spot for an indoor basketball court, a feature on the husband’s wish list. While not quite a half court, the 23-by-30-foot space is “large enough to include the entire key and parts of a three-point circle,” the designer says. A young family’s lifestyle approach calls for clean, classic, uncomplicated design. When a couple with two small children decided to trade their townhouse for a single-family residence in Livingston, New Jersey, the goal was to convert the 1970s ranch into a 21st century center-hall colonial-style home. Weekly meetings with architect Thomas Baio (AIA) PC in Millburn and builder Bill Durso of The Durso Group LTD in Short Hills helped to keep everyone in sync with the homeowners’ vision. “We worked continuously as a team to build their beautiful dream home,” says O’Connor, principal of Jodie O’ Designs LLC in Whippany, NJ. The owners wanted their home to be “casual, simplistic and classic,” O’Connor says. She describes the look as transitional, blending the warmth and comfort of tradition with the clean lines and simplicity of modern style. “They value time with their family…and wanted a house livable for the entire family to enjoy,” she adds. Consequently, they expressed interest in durable finishes and materials, including high-performance fabrics that look great and are soft to the touch. The kitchen delivers the clean, classic look the homeowners envisioned with timeless white cabinetry and Arabescata marble countertops. Functional and beautiful, it meets the family’s needs with multiple work surfaces, separate refrigerator and freezer, and other high-performance appliances and features. The island’s concrete countertop, fabricated to look like wood planks in a contrasting dark stain, meets the owners’ criteria for nearly indestructible, yet beautiful work surfaces. 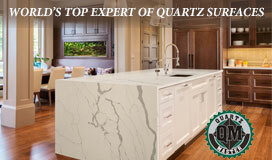 “I love the thickness of the countertops and the juxtaposition of light and dark,” O’Connor says. And because the concrete is virtually maintenance-free, “there’s little risk of staining and/or chipping,” she says. The island stools—upholstered in easy-to-wipe-clean faux woven leather—are equally no-fuss. Hardwood floors in the kitchen and main rooms are stained in English walnut, and neutral tones are augmented by pops of blue and green. “The owners wanted color but used sparingly,” O’Connor says. To that end, they limited color in the kitchen to a graphic, modern damask print in navy and white for the cordless Roman shades. Made of linen, the treatment has a “clean, organic look,” O’Connor says. In the adjacent family room, the mood is relaxed and cozy with a sand-colored chenille sectional, plush leather club chairs and a put-up-your-feet faux leather-top coffee table. Soft bluish-green accents found in the patterned throw pillows, area rug and Roman shades—along with a variety of textures—enhance the neutral scheme. “There are many special architectural elements of the home,” O’Connor says. They include beautiful ceiling beams that accentuate the double-height family room as well as custom built-ins that bring architectural presence to an expansive far wall. A coffered ceiling and wainscoting emphasize the dining area, the first room you see off the entry. Decorated in shades of pale blue and cream, “I wanted it [the dining room] to be like a breath of fresh air…calming but spectacular to look at,” O’Connor says. Drapes are made of silk, and the off-white wallpaper with delicate crystal beads is “so subtle you really have to look to see it,” she says. The wallpaper’s circle motif is echoed on the contemporary credenza, mirror and transitional lighting. “I think it’s a nice juxtaposition against the hard lines of the [African walnut] table and other case goods,” O’Connor says. Upstairs, a loft-like gathering room can be a quiet haven away from the activity in the rest of the home, a place where the kids might go to read or unwind before bedtime, O’Connor says. Sliding barn-like doors can be closed for privacy or to mitigate noise from below. “I love the whimsy and architectural element they bring to the space,” the designer says. For fun, they also carved out space for a 13-by-13-foot secret room off the loft complete with a pivoting bookcase. Even though March madness comes but once a year, there’s an indoor basketball court that provides hoop action all year long. The 23-by-30-foot space is “not quite a half court, but is large enough to include the entire key and parts of a three-point circle,” O’Connor says. The young daughter’s bedroom is designed to take her well into her teen years with a white queen-size bed and custom built-ins with open and closed storage. O’Connor incorporated the little girl’s favorite colors—pink and purple—but used them sparingly and with classic patterns: striped window panels, for example, and washable wallpaper in a delicate trellis pattern. Walls are painted with just a hint of pink, she adds. Overall: architect, Thomas Baio Architect (AIA) PC in Millburn; builder, Bill Durso, The Durso Group, LTD in Short Hills, interior design, Jodie O’Connor of Jodie O’ Designs LLC in Whippany. Kitchen: cabinetry, appliances, Herbeau sinks and Rohl faucets, St. Clair Kitchen & Home; concrete countertop, JM Lifestyles LLC in Randolph; pendants, Visual Comfort & Co.; backsplash tile, window shades, stools (American Heritage Billiards) with custom fabric, Jodie O’ Designs. Family Room: sectional, side chairs, coffee table, window coverings and area rug, Jodie O’ Designs; built-ins, The Durso Group; wall color, Benjamin Moore White Sand; trim, Benjamin Moore Decorators White. Dining Room: furniture, rug, window treatment, chandelier and sconces (Fine Art Lamps) through Jodie O’ Designs. 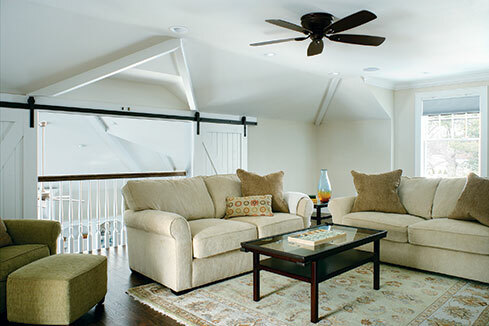 Loft: furniture, coffee table and rug, homeowners’ collection; sliding doors, The Durso Group. 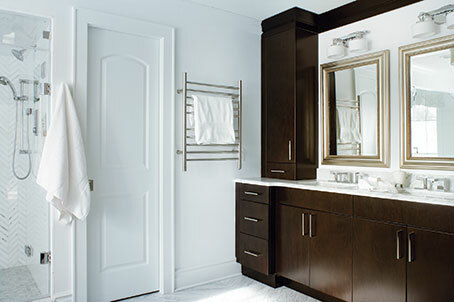 Master Bath­room: cabinetry, countertop, flooring, wall tile and light fixtures, Jodie O’ Designs. Girl’s Bedroom: bed, comforter, wallpaper and window treatments, Jodie O’ Designs; built-ins, The Durso Group; wall color, Benjamin Moore Foggy Morning. Basketball Court: The Durso Group.